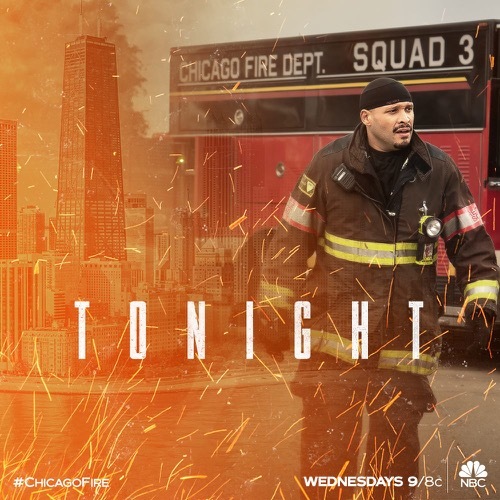 Tonight’s Chicago Fire season 7 episode 9 looks like it is going to be great and you won’t want to miss it. While you’re waiting for our recap make sure to check out all our Chicago Fire recaps, news, spoilers & more, right here! Chicago Fire begins tonight with Matt (Jesse Spencer) sitting in a diner with Naomi (Kate Villanova) talking about the trailers and company they are investigating. He finds her really intriguing but suddenly Matt realizes how late it is and has a shift in 8 hours; whoever is tracking them, leaves right behind them from the diner. Stella (Miranda Rae Mayo) talks to Emily (Annie Ilonzeh) about Dennis at the commissary, where she gives her tips about how to talk to him. Kelly (Taylor Kinney) walks into the locker room, revealing he took the rest of Benny’s stuff to Goodwill, suggesting they go to dinner and a Blackhawks game the following night. She wants to them to go out with Tyler, but he says he is not interested; she is mad he is hung up on this and walks away. Chief Boden (Eamonn Walker) hears Tuesday barking as Ritter reveals she has separation anxiety; he is worried that Boden would be angry but he says she can stay as long as she likes since she is the cutest thing since firehouses and Dalmations go together like cookies and milk. Chloe (Kristen Gutoskie) calls, informing them a new pastry shop opened up, asking if anyone would like an order. Her call is suddenly cut off when there is a massive crash and Chloe’s line goes dead. The alarms sound and everyone races off. Cruz (Joe Minoso) screams out Chloe’s name as there are several cars destroyed. Kelly calls for Capp (Randy Flagger) to get the jaws. Cruz helps others as he continues to search for Chloe, running past all the carnage until he spots Chloe in her blue SUV. Kelly and Matt pull him back as Sylvie Brett (Kara Killmer) check her pulse; Boden calls for MediVac and they work to free her from the vehicle. Brian Zvonecek (Yuri Sardarov) holds Cruz back, trying to comfort him as they extract her. Boden takes Cruz to Chicago Med, they confirm she is there but has no update. Cruz hasn’t met her family, Boden calms him down enough to call his office. The rest of the firehouse comes to comfort Joe. Chaplain Kyle Sheffield (Teddy Sears) learns what is going on, saying he will find out if he can get an update on Chloe. Cruz is told Chloe has an internal brain bleed and they are rushing her up to surgery on the 3rd floor, he runs up the stairs to hold her hand and beg her to make it through and come back to him and she’s the best thing that has happened to him. He sobs at the doors. Cruz returns to the waiting room, where he tells Boden he doesn’t know how it looks. Everyone says they will stay but he wants them to put the rigs back in service and will call as soon as he knows anything. It is no good for Chicago if their best firefighters are all waiting around there. Everyone leaves as Chloe’s parents arrive; they know who he is since Chloe talks about him none stop. Outside, Brett tells Emily they should pick up sandwiches for everyone, but they are stopped by a dean of medication. She is disheartened to see Emily in a paramedic uniform. She admits she was the deciding vote against her, and now she recognizes her mistake; Emily tells her she put it all behind her and is great. She wants Emily to reconsider and re-enroll. Sylvie heard the entire conversation, saying Emily has a lot to consider, leaving it at that. The surgeon comes out, saying Chloe is out of surgery and in recovery; they were able to reduce the swelling and she is stable. He wants them to wait to see her until the anesthesia wears off but Kyle asks for a few minutes as it would do a world of good; he agrees. Joe tells Kyle that was a very nice thing and leaves to call the guys. Matt gets the call and Boden agrees to put the house back in service. Naomi arrives, telling Matt the trailer company has agreed to a sit-down interview with her; they both aren’t sure if it is a good thing. He agrees to be there so she can use his expertise and enjoying the dynamic duo thing they have going. Kelly says Cruz is pretty upbeat and willing to cover the rest of his shift. Stella is about to apologize to Kelly when Tyler arrives unexpectedly when she didn’t respond to his text. Stella says she isn’t sure if their dinner is on because of a schedule thing, but Kelly says she can do what she wants but he is going to the game. Tyler reveals to her that Kelly is jealous and got right up in his face the last time he was there; reminding her about what she went through with Grant and barely made it out alive. He never wants her to go through that again. Stella charges into Kelly’s office, demanding to know if he threatened Tyler when he came looking for her. They begin to argue as Kelly says he knows she isn’t blind so either she can’t admit Kelly is right or she likes leading Tyler on. Stella says this jealous/possessive thing has got to end now or they do! Matt calls Naomi, revealing something he uncovered in the photos that could help their case. Kelly sits on the roof, talking to Matt and smoking a cigar. He admits he feels like he wants to wreck things, he has been like this his whole life; Matt suggests he should quit fighting. Kelly talks about it takes a special breed to be a firefighter and that breed doesn’t work outside the firehouse. Matt says it can be done, referring to several of their friends; it takes work but it can be done. Mouch (Christian Stolte) finds his pillow now says “Tuesday’s” pillow as the dog whimpers when he tells the pooch it is only temporary. Otis reveals Cruz text saying Chloe is still unconscious but the doctors are super hopeful; all agree to head back to the hospital after shift. Sylvie and Emily are called out to a house where a little boy fell off his bed and is badly bleeding, his side ripped right open; the babysitter is told to call the parents. Sylvie tells Emily to hold on as they are going to “fly.” A truck loses its load of ceramic piping, damaging the ambulance, forcing Sylvie off the road. They cannot wait for another ambulance and Sylvie forces traffic to stop, saying it is a medical emergency. She tells the owner of the truck to meet them at Chicago Med, calling ahead about their condition as they are coming in HOT. They make it there and he is immediately taken to Trauma 3; both Emily and Sylvie try to catch their breath. Severide stops Stella outside, saying he never threatened Tyler. She tells him to stop making this about Tyler and doesn’t know what he is fighting but whatever it is, it isn’t Tyler. Kelly walks away, saying he doesn’t know what she wants from him. Matt meets Naomi, where they go to Grandbrook to meet the siblings who own the trailers. They want to clear the air as Naomi says everything they say is on the record. They are furious and yell at her, feeling she is not treating them like humans and inform her they are suing her. They reveal they have footage of her breaking onto private property and then dig into her private life and will use every opinion she used as fact to bury her. She promises them she always uses her facts right and will find something. Matt talks about Cathy Mann, a woman he pulled out of their trailers, while her skin dripped off her body. He knows they are lying and selling the trailers under a shell company. The siblings look at each other and they are ordered to leave; Naomi says she is filing her new story and it will be out in the morning by 8 am and if they try to move their stock again, they will find it again! Matt and Naomi kiss outside, saying they are the perfect tag-team. He apologizes for kissing her, but she kisses him back. Chloe begins to wake up with Joe at her side. She whispers his name and kisses his cheek. He smiles, saying he is going to get the nurse and her parents are there. He tells her parents that she is awake, alert and asking for them; her father runs in. Chloe’s mother tells Joe that Chloe has been through a lot before all this and the light spot in her life is the new firefighter she is seeing and he has no idea how much she has needed him. Joe holds her hand, saying she has a great daughter. Joe watches Chloe with her parents when Sylvie and Emily arrive. Joe tells Emily how much Kyle was a help; she says her guy Kyle is the best. Sylvie knocks on Kyle’s door, closing it behind her. She asks him out for dinner with her tomorrow night and he readily agrees. Meanwhile, Boden has a drink at Molly’s where he tells Emily about the call he got from the Dean wanting her to re-enroll. He knows what kind of doctor she would make. It would be sad to see her go, but she would make one hell of a doctor; Emily reveals she is declining the offer because she went to med school for all the wrong reasons. It was cutthroat and she was holding the knife like the rest of them but it ate her up inside. She came to 51 and its a family, thinking there was a catch, except there wasn’t. She realized she likes herself there at 51 and it is a family; Boden says she is a part of this family. Boden tells Otis that Emily is drinking on him tonight. Matt and Naomi are busy kissing and getting undressed in his place while Kelly sits at home watching the game. He answers the door and its a pizza delivery, disappointed its not someone else. Stella looks into the bar and sees Tyler sitting alone, she walks in sits with him, saying he knows her well. In the middle of the night, Matt wakes up to find the entire place engulfed in flames, with no way to escape.